Texans say immigration tops their list of state concerns. 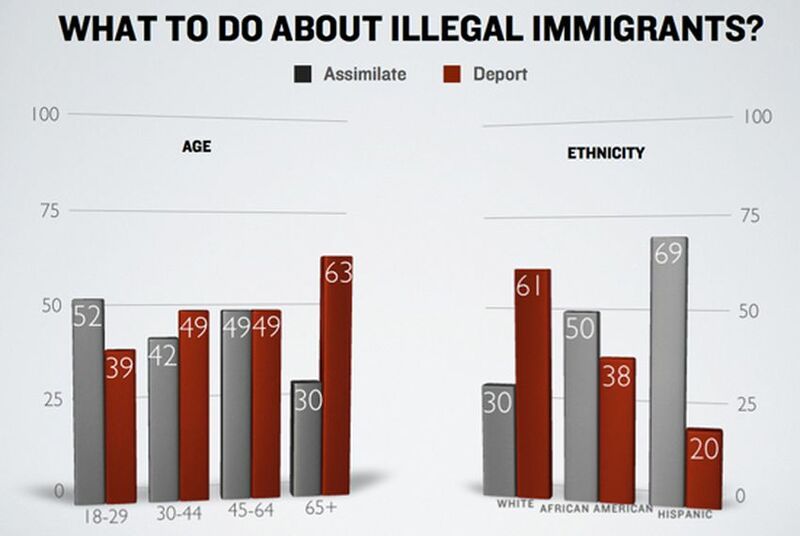 Nearly half of them say illegal immigrants should be deported, as against 41 percent who think the immigrants should be allowed to keep their jobs, assimilate, and eventually be allowed to apply for legal status. While 49 percent of Texans say the immigrants should be deported, younger people and minorities are more likely than Anglos and older people to support assimilation. Among Anglos, it's 61 percent to 30 percent in favor of deportation. African-Americans favor assimilation 50 percent to 38 percent. Latinos favor assimilation by a 69 percent to 20 percent margin. The pollsters found a generation gap, too. Assimilation is favored by 18 to 29 year olds, 52 percent to 39 percent. The older the Texan, the stronger the preference for deportation. In the 30 to 44 age group, deporters outnumber assimilators 49 percent to 42 percent in the poll. The next group, 45- to 64-year-olds, show about that same spread, favoring deportation 49 percent to 41 percent. Over 65? Only 30 percent of that group favors assimilation, as against 63 percent in favor of deportation. • More Anglos — 44 percent — identify themselves as Republican than independent or Democratic. That's the number who said they'll definitely vote in the GOP primary — another 15 percent said they probably will. African-American voters say they'll definitely (55 percent) or probably (13 percent) vote in the Democratic primary. Hispanics lean to the Democrats, but they're less divided, with 27 percent on the red side of the room and 36 percent on the blue side. In that group, 26 percent say they don't know which primary they'll choose. Both men and women in Texas are Republican, but there's a difference: 50 percent of male respondents say they'll vote in the GOP primary, and 40 percent of women say they will. And there's a gap between city folk and everyone else. Voters in the "big four" metro areas — Houston, Dallas-Fort Worth, San Antonio, and Austin — are a little less likely to vote in the GOP primary than their country kin, but a lot more likely to vote in the Democratic primary (they're still Republican, overall). Voters in the metros are Republican by a 43 percent to 33 percent margin. Outside those areas, it's 48 percent to 23 percent. • Republicans who describe themselves as ideologically "in the middle" favor Kay Bailey Hutchison in the governor's race, while those who describe themselves as "extremely conservative" prefer Rick Perry in that race. Perry leads Hutchison 42 percent to 30 percent, as we reported earlier this week. • The gender gap in the GOP primary isn't what you might expect: Perry beats Hutchison with both male and female voters and actually has a better margin with women. His advantage among men in the survey is 43 percent to 34 percent; among women, it's 39 percent to 25 percent. • The remarkably strong feelings about the work Congress is doing — 71 percent of Texans disapprove of it — get stronger as the ideology of the electorate gets more conservative. Ask voters to ID themselves as Democrats and Republicans on a seven-point scale that ranges from strong Democrat to strong Republican, and you find the people unhappy with Congress on the middle to right end of the scale. Unhappy independents total 73 percent, along with 98 percent of "lean Republicans", 87 percent of "not very strong Republicans", and 94 percent of "strong Republicans." • Texans don't think the country is heading in the right direction, but that's not a uniform opinion. Minorities in the poll say the country is on the right track. Two-thirds of African Americans and 44 percent of Hispanics think the country is on track. Only 20 percent of blacks say the country is on the wrong track; 40 percent of Hispanics say so. The Internet survey of 800 registered voters was conducted October 20-27 and has a margin of error of +/- 3.46 percent. The GOP primary questions have a +/- 5.19 percent margin of error; the Democratic primary questions have a margin of error of 6.01 percent.